Synopsis : Information and definition of bariatric equipment and aids that caters for the larger person and feature increased weight capacities. Obesity has become one of the primary medical issues facing our society today. One of the concerns facing people with this condition is the increased effort required for mobility and general lifestyle independence. With childhood obesity levels also rising, the needs of heavier patients and those caring for them, have to be addressed. Simply put it is equipment and supplies that are designed for larger or obese patients. The term bariatric aids, or bariatric equipment, comes from the merging of two Greek words, "baros" which means weight and "iatrics" meaning medical treatment. Bariatric Equipment designs cater for the larger person and features increased weight capacities, heavy duty supports and wider widths to fit the persons needs. Bariatric wheelchairs are designed to be stronger, sturdy, and larger to suit the needs of an obese person. Most equipment defined as bariatric has a 300 - 900 pound weight limit - though there is not a specific width or designated weight limit that defines bariatric products. 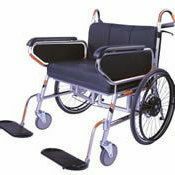 Exceeds the Working load limit (WLL) and dimensions of the support surface such as a bed, chair, wheelchair, couch, trolley, toilet, mattress. Today, there are numerous types of bariatric aids available on the market to serve a number of purposes and assist an overweight person perform everyday tasks. Bariatric Seating and Lifts - Including lift recline chairs and lifting devices. Bedroom Equipment - Heavy duty and adjustable beds, bed transfer boards, hoists and slings, patient lifters, pressure care mattresses. Bathroom Aids - Such as: Heavy duty bath transfers, bathroom chairs and benches, mobile shower and commode chairs, grab bars and handles. Bariatric Mobility Aids - Products such as: bariatric rollators, wheelchairs and walking aids. Add-on power packs can help a carer control an electric wheelchair with an occupant. Bariatric surgery is a scientifically proven, more successful approach to weight loss compared to a pill. Examples of bariatric surgery include gastroplasty surgery, gastric bypass surgery, and jejunoileal bypass surgery. According to a recent study, (2012/09/18) from the University of Gothenburg, bariatric surgery reduces the long-term risk of developing diabetes by over 80 % among people with obesity. The New England Journal of Medicine (NEJM) has published the results of a study conducted at Sahlgrenska Academy, University of Gothenburg, Sweden. The study is based on an extensive study entitled Swedish Obese Subjects (SOS), which has given rise to more than 90 scientific articles and demonstrated that bariatric surgery is also highly beneficial when it comes to cancer, cardiovascular disease, total mortality and health-related quality of life. If you are overweight and have decreased dexterity, flexibility, and mobility, bariatric aids can assist you by giving you more independence. Our disability products and bariatric aids shop includes items such as leg lifts, long handled shoe-horns, reachers and other helpful products and aids that can help you overcome these challenges, as well as maintaining more independence, in and around the house.